Evanston Police inspect the scene where a 74-year-old woman drove her van into the CVS in downtown Evanston, breaking the store's window and damaging part of its brick wall. 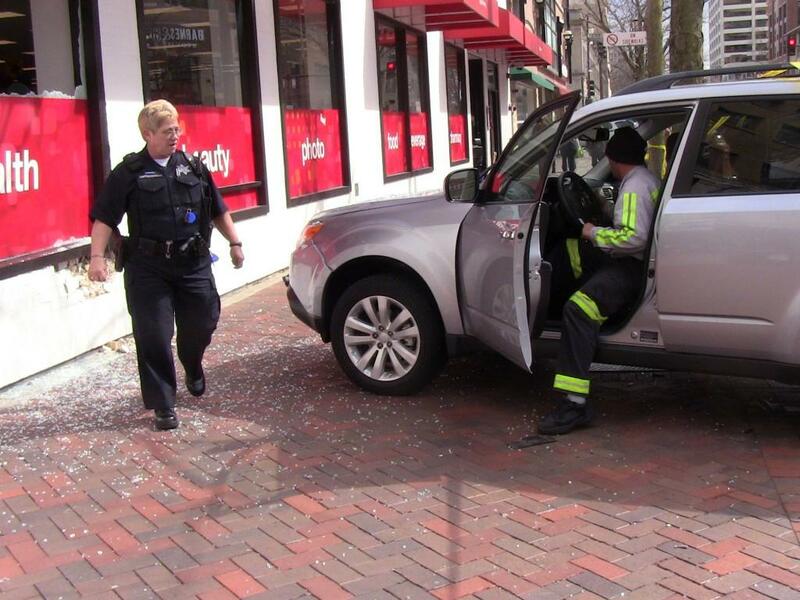 A 74-year-old woman drove her van into CVS in downtown Evanston on Tuesday afternoon, damaging part of the store’s brick wall and breaking its window. The woman hit the accelerator while trying to park in front of the pharmacy at 1711 Sherman Ave., Evanston Police Cmdr. Jay Parrott said. No one was hurt in the accident, Parrott said, but the window near the store’s beauty accessories section was shattered. Police also taped off a corner of the store. The damaged building was inspected by the city’s property standards department for safety, police said. Seth Davis was near Barnes & Noble bookstore on Sherman Avenue when the accident occurred. There was some confusion and panic among other witnesses, Davis said. Firefighters pulled a locked bike from under the van, which also knocked down a parking meter before colliding into the store. EPD gave the driver two citations, including one for failing to reduce speed to avoid an accident, Parrott said. EPD also recommended she be retested at the Illinois Secretary of State’s Office for driving privileges.